When an event occurs in United States history like the one that occurred roughly 24 hours ago, everyone has something to say about it. First Lady Michelle Obama is scheduled to throw out the first pitch at Camden Yards before a game between the Baltimore Orioles and Tampa Bay Rays next Tuesday. On Monday, I wrote about how my respect level for President Obama as a baseball fan increased a tad with his refusal to do the wave. To be honest, I have no idea what to make of President Obama as a baseball fan. A visit to the White House is special for any winning team that gets invited. Last week we told you that President Barack Obama was going to throw out the first pitch at the Nationals season opener Monday. 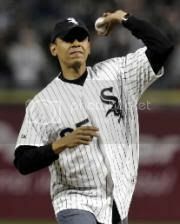 President Obama Offending White Sox Fans by Throwing Nationals First Pitch? With the Steelers making their appearance in D.C. to be honored for winning the Super Bowl, James Harrison was missing.